Gold Cross Low Temperature Dyes are a range of fibre reactive dyes that will achieve strong yields on cotton, rayon and other cellulose materials. They rely on a chemical reaction, taking place, that sets the dye into the fibres of the garment. They are available in a range of 29 colours. These standard colours may be blended to produce an unlimited variety of colours. Gold Cross Low Temp Dyes are vibrant, permanent and colourfast when treated in' accordance with directions. The 25g pack contains 10g of dye and 15g of Setting Agent in two separate heat sealed packets within a plastic phial. This amount of dye is sufficient for up to 250g dry weight of fabric. For Low Temp Dyes it is recommended that all dye and setting agent be used in one application. 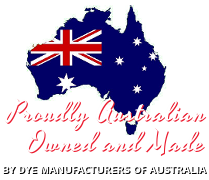 As all necessary ingredients are sealed in the one container the average domestic dyer will find this the most convenient low temperature dye available on the market.